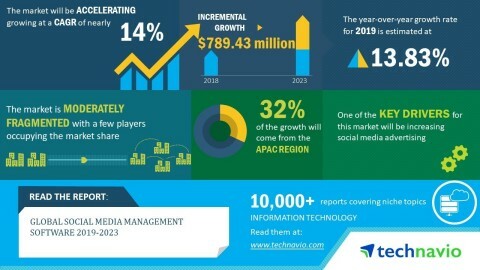 Technavio has announced the release of their research report on the global social media management software market for the forecast period 2019-2023. This global social media management software market analysis report segments the market by deployment (cloud-based and on-premises) and geography (APAC, Europe, MEA, North America, and South America). Global social media management software market size will grow by almost USD 789.43 million, at a CAGR of 14%. Use of analytics in social media management software helps enterprises to track trends and measure growth. The solution also helps them customize dashboards or templates and provides information about their account holders engagement with their content. Many vendors are offering social media management software solutions backed with analytics. For example, eClincher Inc. offers solutions that include powerful analytics for each profile and all the tweets and posts of the enterprise. This helps the enterprises to understand the performance of their posts and their followers' trends. This growing trend of the use of analytics can lead to an increase in demand for global social media management software during the forecast period. Social media advertising expenditure is increasing every year, and positively affecting the growth of social media platforms such as Facebook (News - Alert) and Twitter. Several e-commerce companies are spending on social media management software solutions to reach consumers. Vendors such as Buffer are offering solutions that help enterprise marketing teams to schedule posts, analyze performance, and manage social media accounts at one place. Such developments will drive the growth of the global social media management software market. "The increased use of social media in the North American region is encouraging many vendors to develop advanced social media management software solutions. The market is expected to grow in this region as many enterprises are embracing social media management software as an important platform to connect with their customers. The APAC region will witness a faster growth due to the growing adoption of social media platforms by enterprises in countries such as China, Japan, and India. The increased use of social media platforms will boost the growth of global social media management software market over the forecast period," says an analyst at Technavio. Many vendors are forming strategic alliances to help the enterprises enhance product offerings and increase their online presence. For instance, Lithium Technologies (News - Alert) LLC recently merged with Spredfast to deliver enhanced customer services across diverse channels. Sprout Social received funding from Goldman Sachs to help to expand its operations internationally as well as to improve its social media management software.